The easy to use, go anywhere pop-up travel bed. Recommended for Ages 0 to 18 mths. Light weight and compact making it perfect for travel - easily fitting into a suitcase or the back of the car. 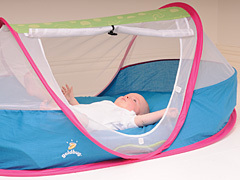 PeaPod provides a great place for little one's to sleep, rest and play when away from home. No more worry about having clean and comfy bedding while you're on the road. The Pea Pod comes with its own padded mattress, a zippered carry bag and it pops open easily into a bed in seconds. No messing about with mechanisms that can go wrong or are hard to set up! The high visibility mesh panels can be secured or left open (with safe velcro fasteners) to protect from insects and allow quick access for parents. *Please note Express Post not available for PeaPod orders.